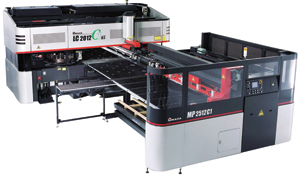 Amada America, Inc., Buena Park, CA, introduces the LC-C1NT combination punch-laser machine, engineered to reduce the time required to transition a sheetmetal blank between modes from the typical 5 sec. down to as little as 2.2 sec. The cumulative effect of this time savings across a full sheet of nested parts, say company officials, can easily add up to 2 min. or more per sheet of reduced run time. In addition to the reduced transition time, the C1 has been designed with new Y-axis punch- and laser-positioning drive modules that employ digital direct-drive servo motors, eliminating the need for gearboxes. This provides positioning accuracy to ±0.003 in., some 25 percent more accurate than machines that use a gearbox in their Y-axis drives, the company says.